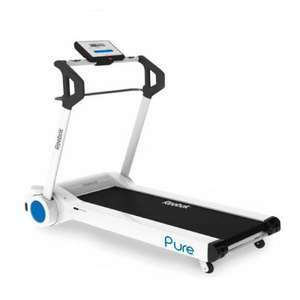 This mains powered, foldable treadmill is great for working out in the comfort of your own home. It has 2 level manual positions. Reach speeds up to 14kph and get feedback on your workout using the hand grip pulse sensor to keep on track of your fitness plan. Improve your cardiovascular health and tone up leg muscles. Running surface size L120, W40cm. Programmes include: 3 target programmes - time, distance, calories. 3 preset programmes - 15, 30, 45 minutes. Console feedback including: time, speed, calories, distance, pulse, RPM. Maximum user weight 100kg (15st10lb). I have one of these. £300 is about right. It's a good machine and fairly easy to store and hide; comparatively extremely easy. It's still heavy and you still need a good ground floor space to use it in. I for one have very little time to go out running, so it's been great to have something to jump on morning and evening whenever I get a spare half hour I want to make the most of. I'd say £300 is the normal price. Maybe see £250 in January sales?